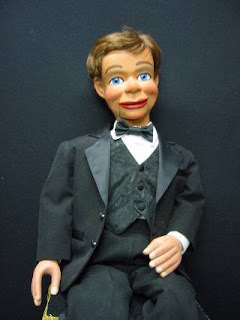 In three articles last month, The Reincarnation of Mike McGuire, A Counterfeit Dummy, and Mike McGuire: Tossing Out Most of Him, I told the story of my first ventriloquist dummy and how I am about to bring him back to life as a full-sized figure. Mike is finished now, except for his costume. Here he is wearing Dexter's tuxedo. 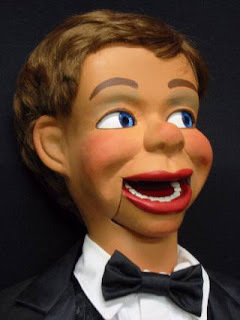 He kind of resembles Jerry Mahoney, doesn't he. That's no accident. I longed for such a figure exactly like this one when I was a kid. It had to have moving eyes, it had to look something like Jerry Mahoney, and it had to have blue eyes. What's that? Blue eyes? Jerry Mahoney didn't have blue eyes. Neither did the two Juro Jerries that were versions 1 and 2 of Mike McGuire so many years ago. But everyone else in my family, both parents and my four brothers and I, all had blue eyes. As did my grandmother after whom Mike is named. I never figured out how to change Mike's eye color without messing him up when I was a kid, so he kept those painted-on brown eyes. But I never stopped wishing for the real, professional, blue-eyed edition. Now the kid's dream is an adult's reality. Mike McGuire lives again. But there are problems. He sounds just like Dexter and doesn't know any jokes of his own.